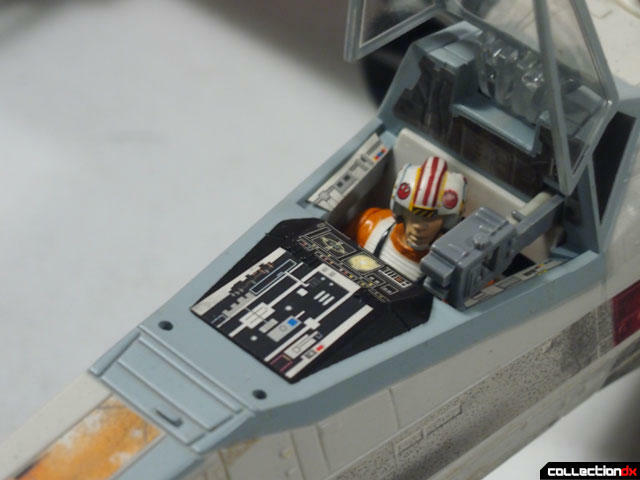 This review is of one of the best toys to come out of the Power of the Force line - the Electronic Power F/X Luke's Red Five X-Wing. 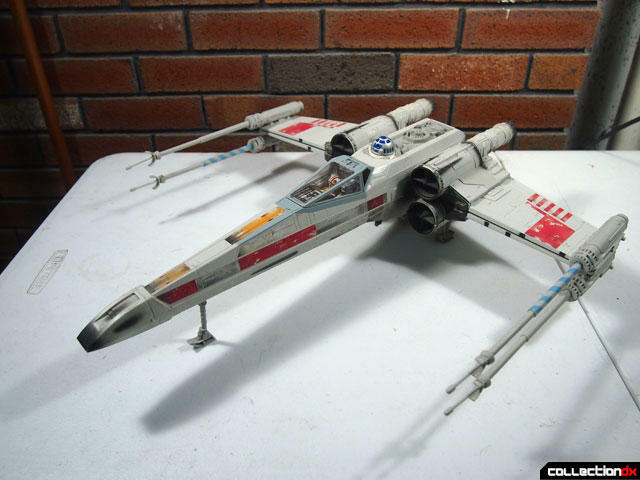 During the original vintage run of Star Wars toys, there was only one X-Wing toy, and although it was reissued several times (including a battle damage ver) it was essentially the same toy. 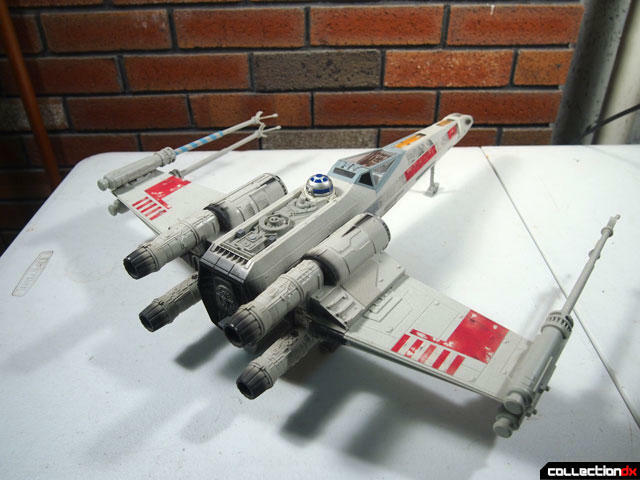 When Kenner launched the new Power of the Force line, they yet again reissued the X-wing in the initial vehicle assortment. 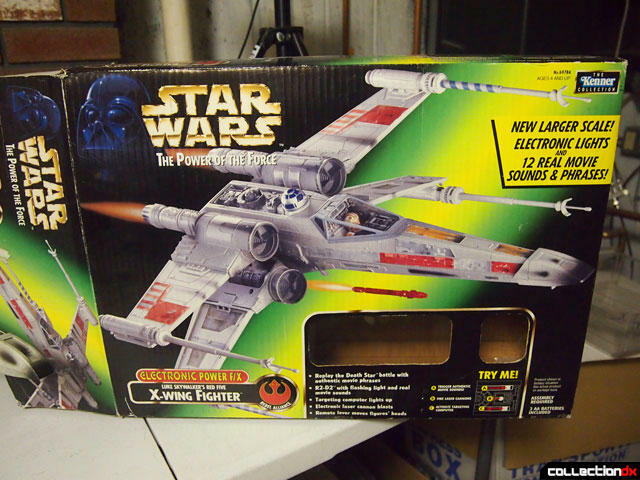 It wasn't until this release in 1997 did Kenner go back and create an all-new X-wing that was somewhat in scale with the 3/34 scale figures. 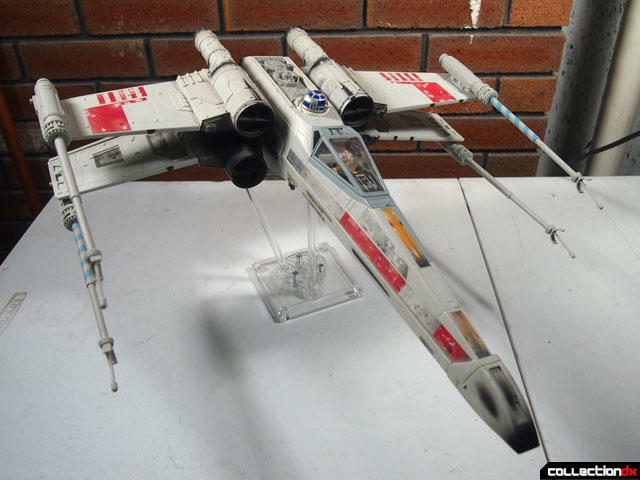 Kenner went all-out with this release, creating a stellar toy that still holds up as one of the best X-Wing toys to date. 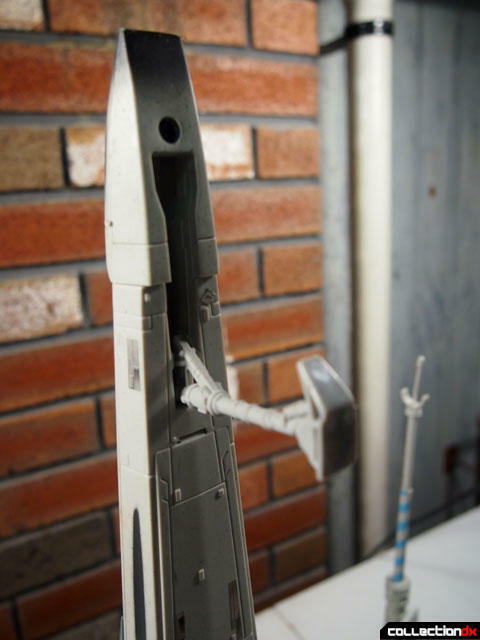 It's one of my favorite Star Wars pieces. The bright and sturdy box proudly declares that this is a new larger scale with "Electronic Lights and 12 Sounds and Phrases" There's a die-cut window on the front, and on the back each of the particular action features are called out. 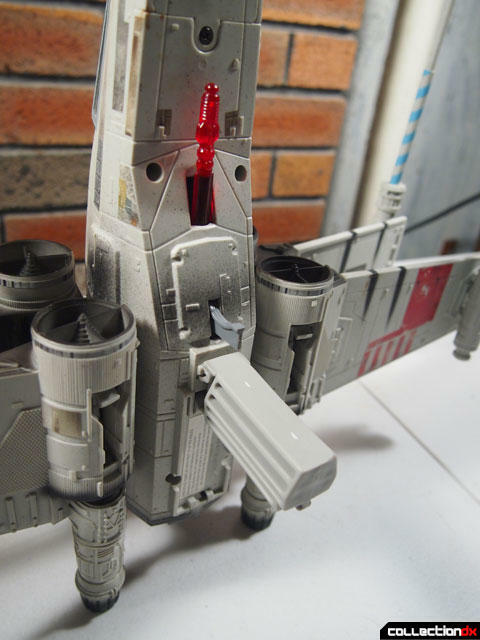 Inside, the toy requires assembly (wings and lasers) and a ton of stickers needs to be applied. It was fun to both assemble the toy and spend an hour adding all the decals. 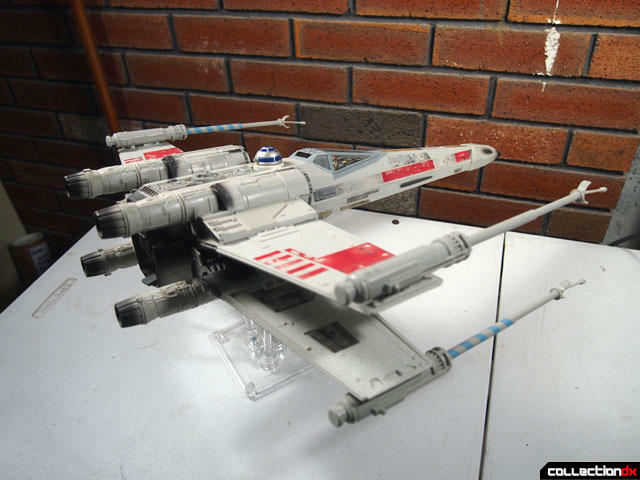 The assembled toy is a monster with a 20" wingspan. It just looks amazing from every angle. 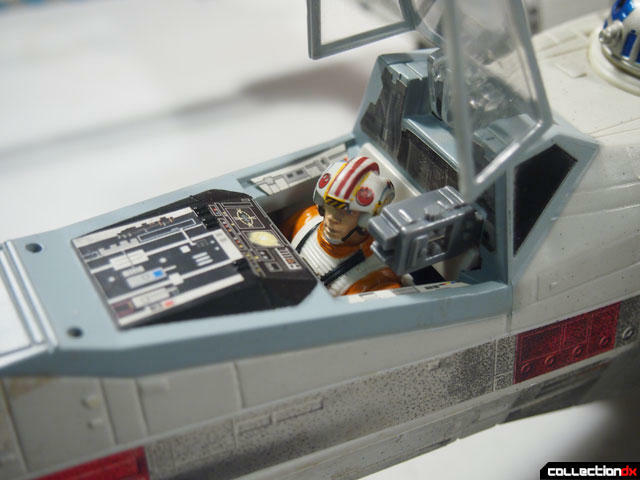 The opening cockpit reveals a non-removable Luke. 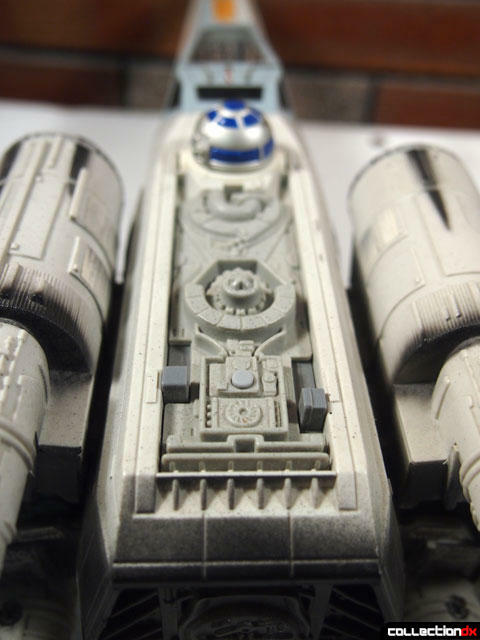 For years it bummed me out that you couldn't remove Luke or R2 but now I realize that they are integral to the action feature (which I'll demonstrate later). 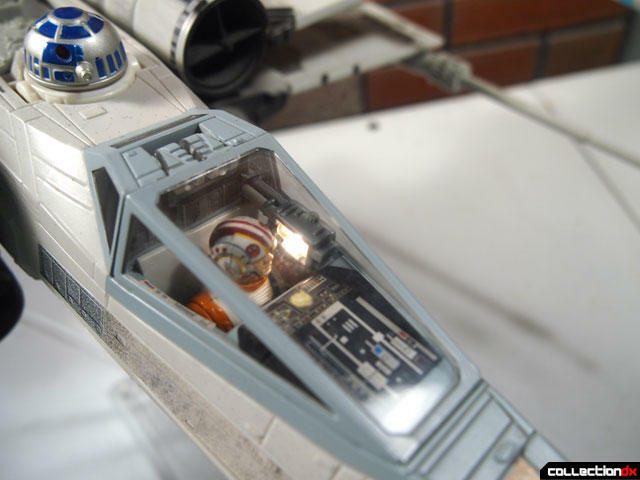 The cockpit is nicely detailed due to all the stickers that I had to add. 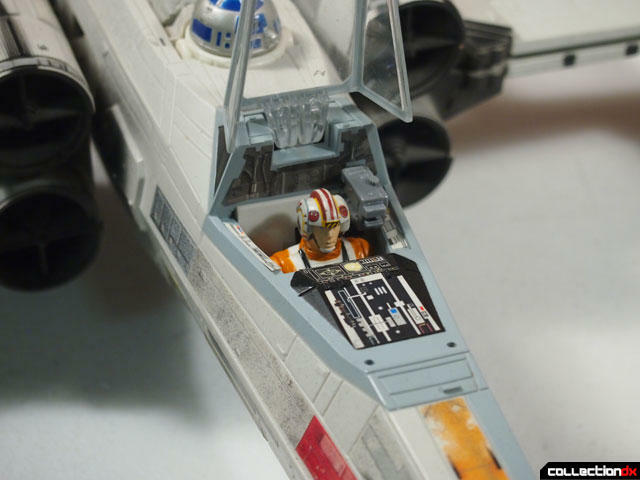 R2-D2 sits behind Luke, and is also not removable. His dome cannot turn without the action feature, but it's totally worth it. 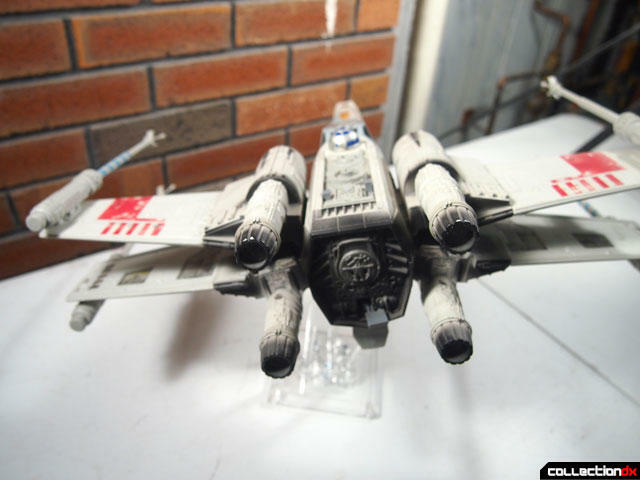 The main action feature is the ability to re-enact the Death Star trench run with a series of light, sound and motion effects. 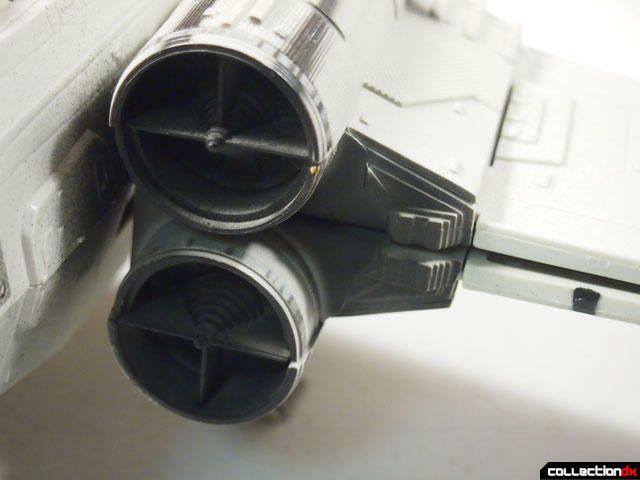 These effects are activated by the two levers on the rear of the fighter. 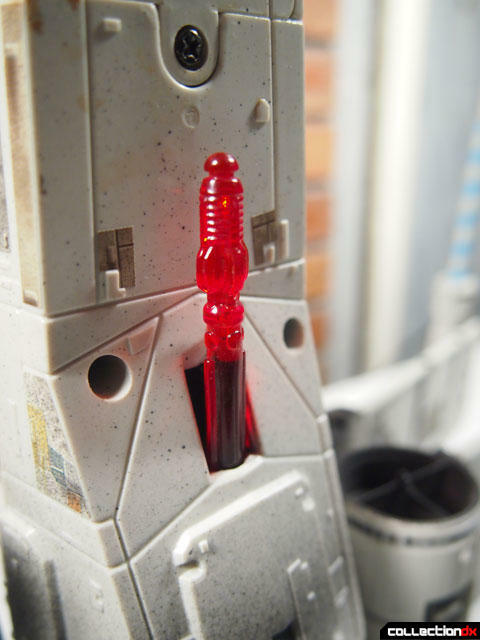 One lever activates Luke and R2's exchange as they begin the trench run. 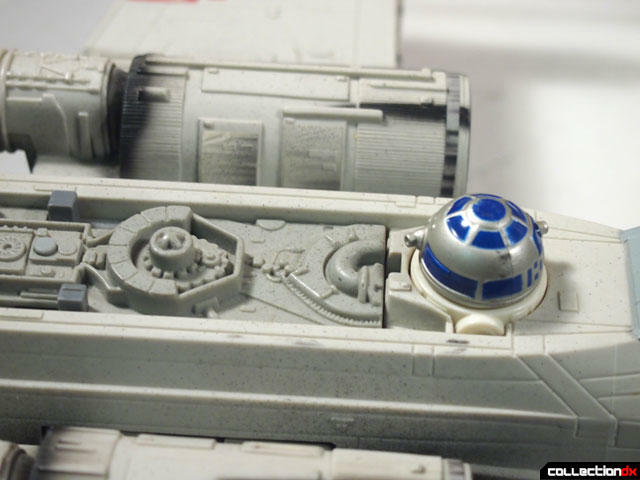 Each motion of the lever activates a sound and moves both Luke and R2's head. When R2 speaks, he lights up! 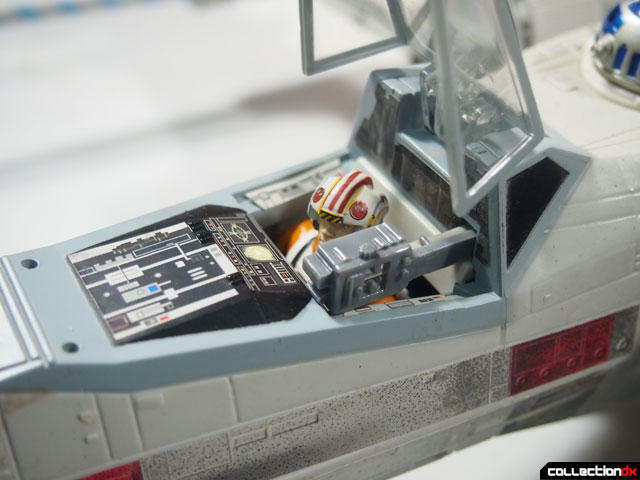 Luke can engage his targeting computer by pushing forward the other lever. 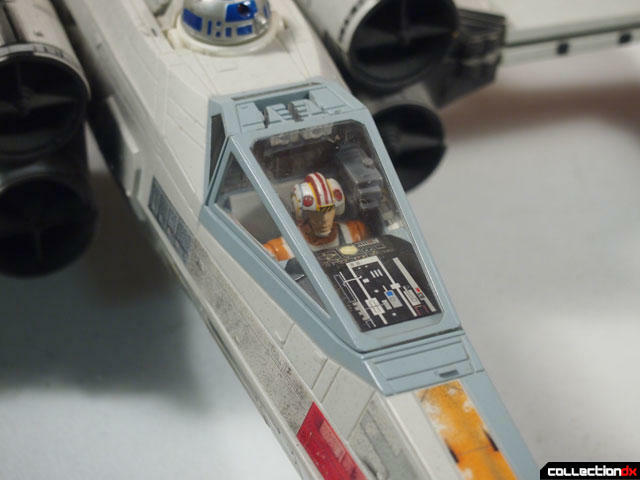 The targeting computer lights up as Obi-Wan tells Luke to use the force..
On the bottom of the ship there is a flip-out handle that you can use to "fly" the ship around. 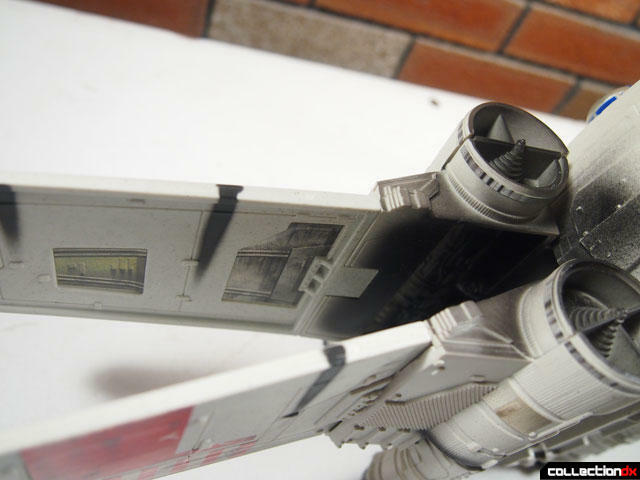 In front of that is a trigger which launches a red missile (Proton Torpedo), which ultimately destroys the Death Star. Each click of the trigger makes a sound effect. 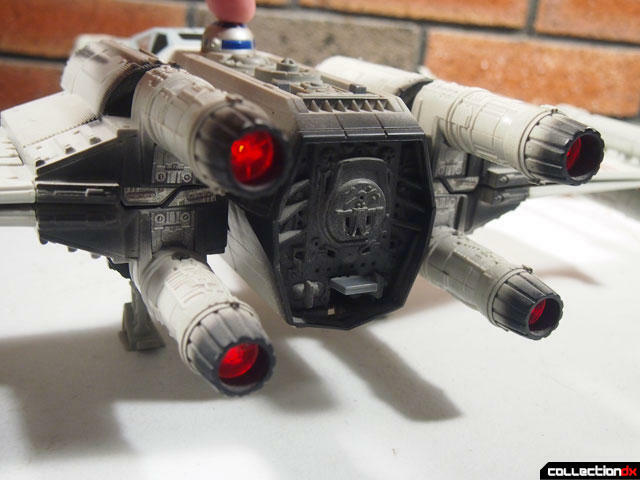 The button in the middle makes laser blast sounds from the wing cannons. 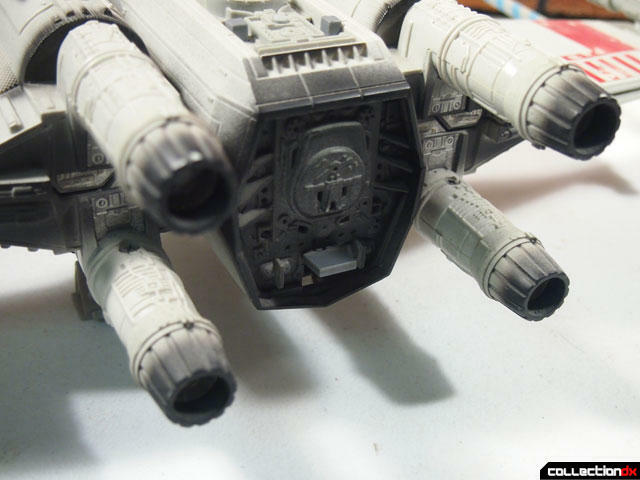 Each of the three landing gears folds out form the body. 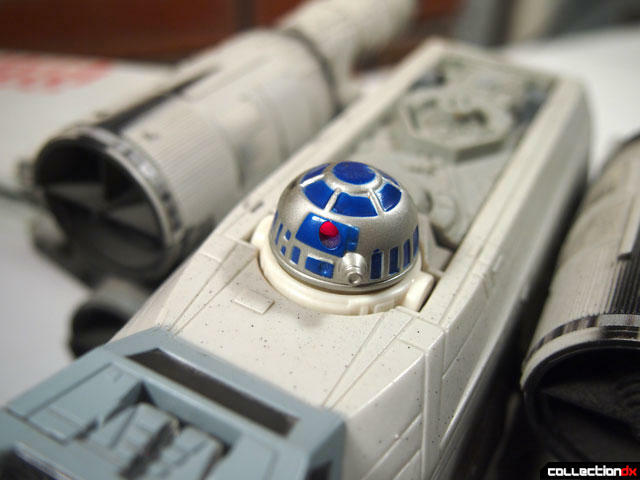 If you press the head of R2 once, you get a quick bit of R2 beeping. 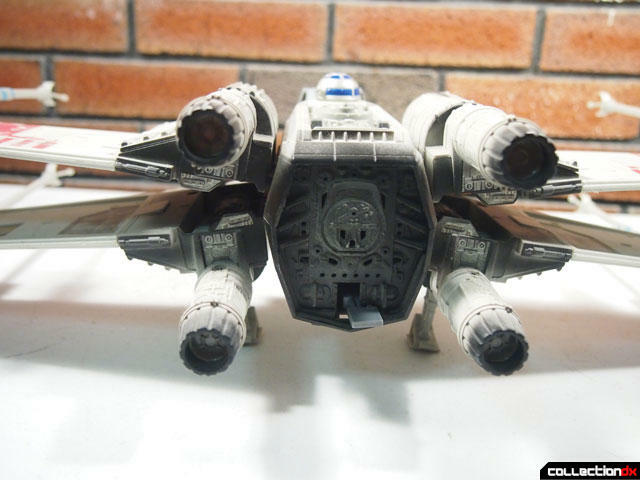 But if you HOLD R2 down, you activate the engine sound and lights. 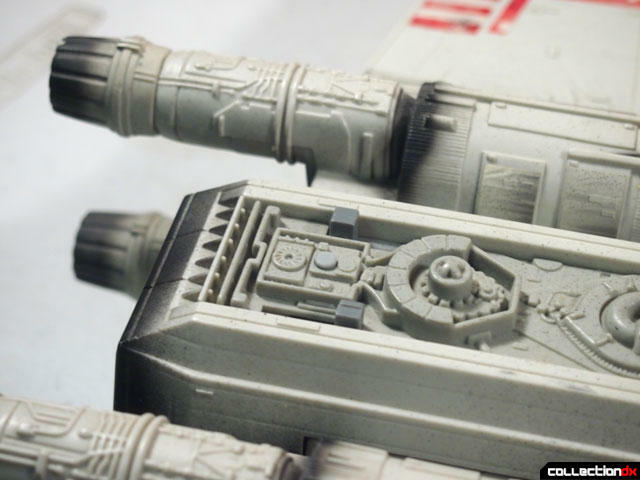 The amount of detail on a toy primarily meant for kids is staggering. 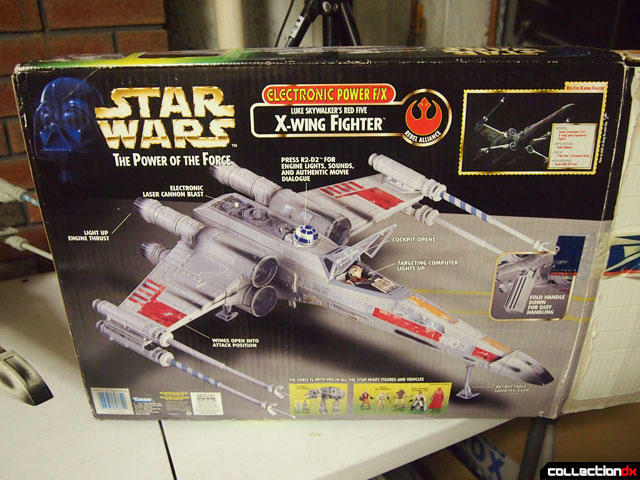 At this stage, Kenner / Hasbro had not really tapped into the collector market much so this was mostly aimed at kids with a strong sense of play value. 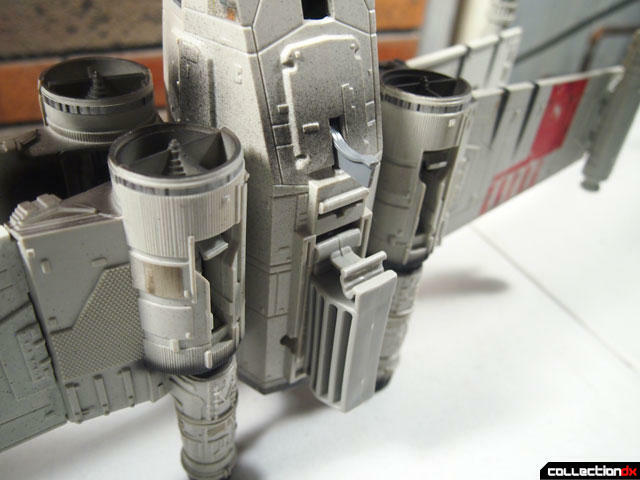 The weathering on the engines is great. 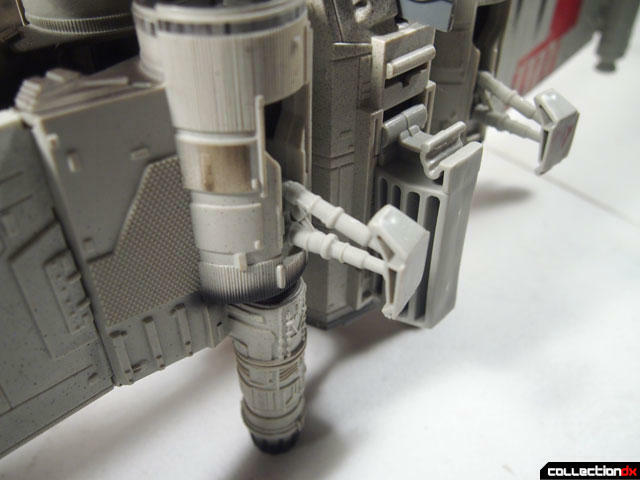 To "Lock S-Foils in attack position" you push down a lever on the back and then lock it in off to the side. 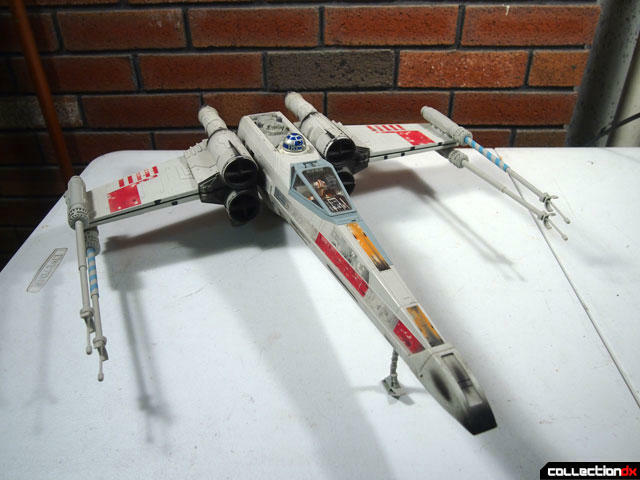 It feels like there is a lot of stress on this tab, but in all the years I have had this toy it has never broke. If anything the opening of the wings feels a bit springy. Once locked in place, they are secure. 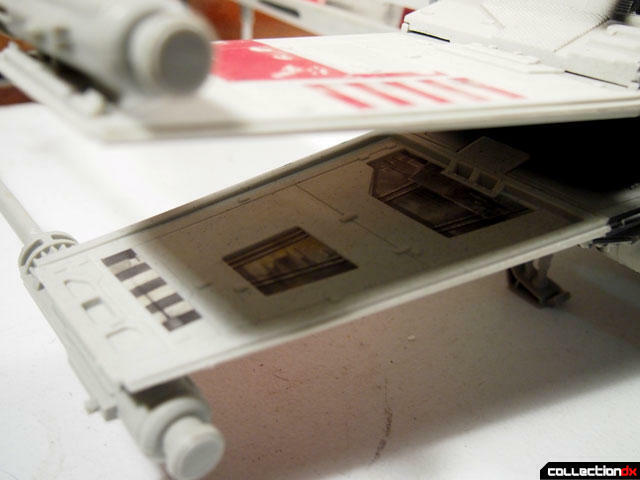 There's even great detail on the insides of the wings. 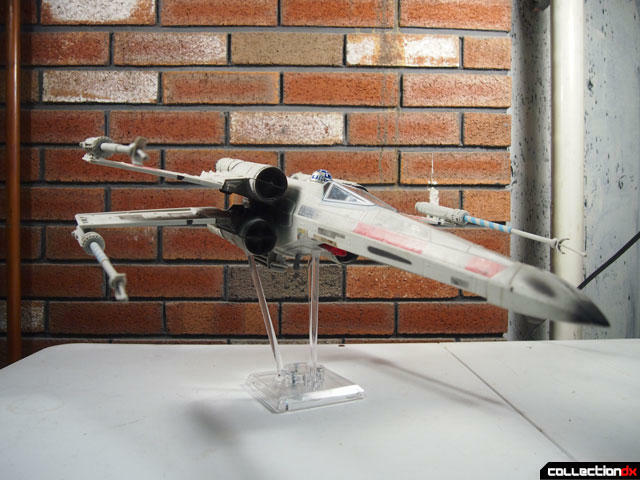 This toy has been re-released several times since this initial release with varying amounts of changes. 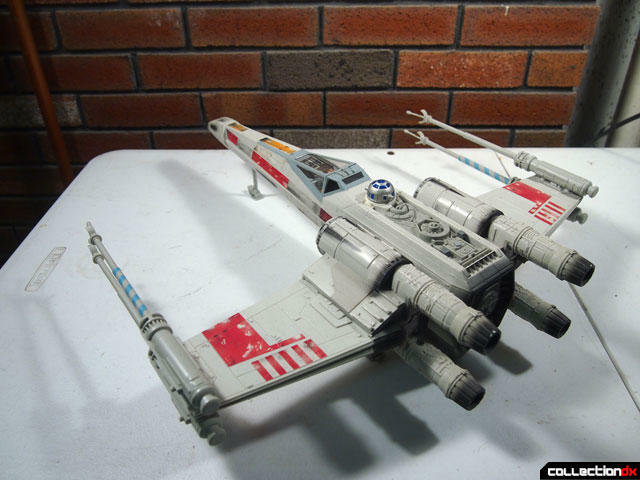 All have removed the electronic effects in exchange for the ability to insert your own pilot and R2 unit, but for my money this is the perfect balance between TOY and collector item. 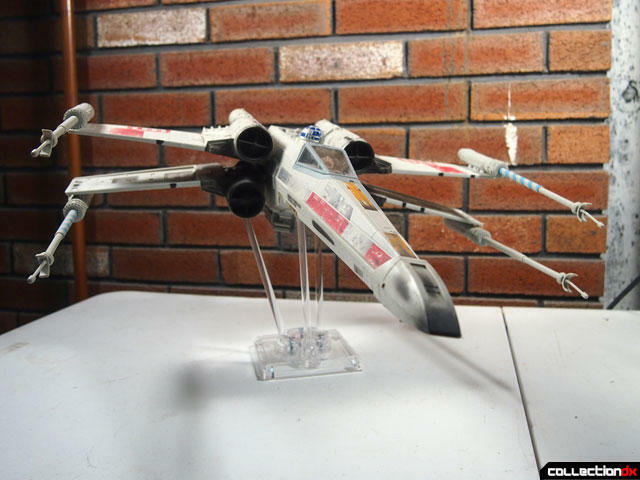 It's really amazing, and worth adding to any star wars collection. 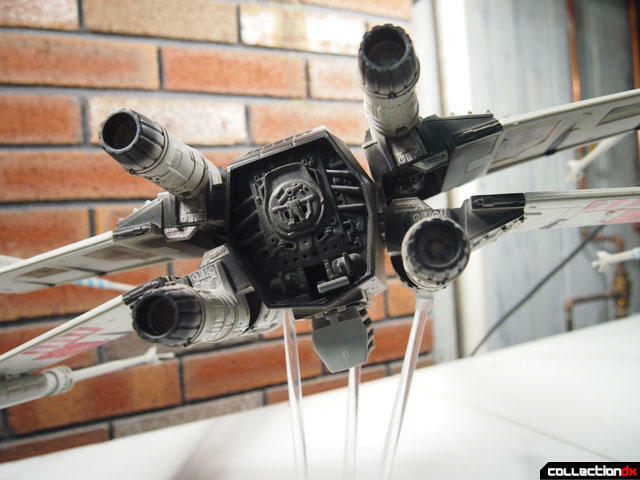 One of the only Star Wars ships I regret never picking up.